Peachicks are baby peafowl, more commonly referred to as peacocks. Peahens are excellent, attentive parents who normally teach their chicks the skills to grow into healthy adults. Birds in captivity, however, may not instinctively care for their young, and chicks being raised separately from their parents need intensive human care. When peahens have the opportunity and inclination to care for their young, they are good parents. Perhaps the most important skill peachicks must learn is how and what to eat. Peahens walk around with their chicks and vocalize and teach them which foods are appropriate choices. Peahens spend most of their time in close proximity to their babies and will aggressively protect them from predators. Peachicks raised by humans or whose parents aren't teaching them how to eat must be fed an appropriate diet. Many farm supply stores sell pre-mixed peachick food. Alternatively, peachicks can subsist on cracked corn, egg yolks, cat food, oats, trout chow, rabbit pellets, grass, sunflower seeds and dandelions. If you're feeding peachicks a commercial pheasant food, be sure to periodically supplement your chicks' diet with some of these foods to ensure optimal nutrition. During the first six weeks of life, feed chicks a chick starter food, which should be available at farm stores and many pet stores. Encourage your chicks to eat by mimicking the behavior of peahens. Peck your fingers in the food and make a soft clicking or chirping sound with your mouth. Peachicks should be kept in a brooder at approximately 95 degrees Fahrenheit during the first six weeks of life. If the chicks are being housed with their mother or you'd prefer not to use a commercial brooder, place the chicks under a brooding lamp and keep the temperature at or near 95 degrees Fahrenheit. Decrease the temperature of the brooder by 5 degrees every week until the temperature reaches ambient room temperature. At this point, the chicks will no longer require a heat light. Baby peafowl are considered chicks until they are 1 year old and will require extra care and supervision during most of this time. They are capable of flying when they are only a few days old but can easily injure themselves or fall. Be sure to prevent your peachick from escaping and ensure that there are lots of soft places to land. Peacocks can live 30 to 40 years, though peachicks are highly vulnerable and can die of numerous causes in the first year of life. 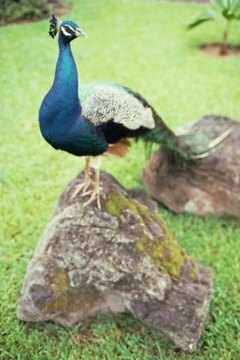 What Are Some Unique Characteristics That Peacocks Have at Birth? What Is a Peacock's Diet?